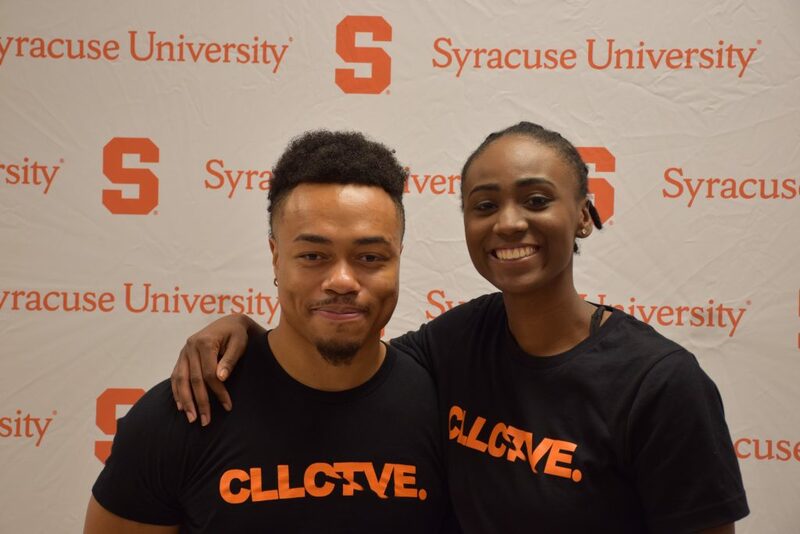 The first-ever ’Cuse Tank—co-sponsored by the Blackstone LaunchPad and Syracuse University Libraries—celebrated the entrepreneurial spirit of SU innovators during the recent Family Weekend. A distinguished panel of parent judges who are successful entrepreneurs from a variety of industry sectors voted on finalist teams who vied for $10,000 in prizes. The contestants came from across campus, including the College of Arts and Sciences, the College of Engineering and Computer Science, the College of Visual and Performing Arts, the Falk College, the Newhouse School, the School of Information Studies and the Whitman School. CLLCTVE also hosted a successful, widely attended conference for creatives, “Art of Finesse,” at the Newhouse School as part of Family Weekend activities. The education and networking event featured industry advisors who spoke on an array of topics relative to honing a creative lifestyle and capitalizing on talents in productive ways. Keynote speakers and panelists were Evin Robinson, co-founder of New York on Tech; Tiffany Bender, senior producer at Teen Vogue; and Jonathan Jackson, co-founder of BLAVITY. “It was truly humbling to win this award amongst so many other great companies,” says Kelsey Davis, a senior television, radio and film major in the Newhouse School. “Ryan and I moved to Syracuse in July for the sole purpose of getting plugged into the SU innovation ecosystem as soon as possible. Since then, we have been working extremely closely with our advisors and the Blackstone LaunchPad to build an agency that develops collegiate creatives, in partnership with universities across the country.